A reporter returns to her hometown in order to investigate a mysterious murder case, and while she is at it, her own tormenting past keeps haunting her. 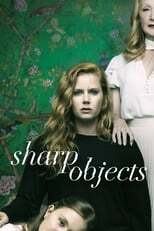 Where can you stream Sharp Objects? On 2018-07-08 Drama/Mystery TV Series Sharp Objects first aired on HBO. Written and created by Marti Noxon, and produced by Entertainment One & Blumhouse Television, Sharp Objects has ended and last broadcasted on 2018-08-26.